IBM Tivoli Endpoint Manager for Security and Compliance Call for lowest Price! IBM Tivoli® Endpoint Manager for Security and Compliance addresses security challenges of distributed environments with endpoint management and security in a single solution. IBM Tivoli® Endpoint Manager for Security and Compliance, built on BigFix® technology, is an easy-to-manage, quick-to-deploy solution that supports security among distributed endpoints, reducing costs and complexity of management while increasing business agility, speed to remediation, and accuracy. Tivoli Endpoint Manager for Security and Compliance addresses security challenges associated with desktop, mobileand distributed environments. By providing endpoint manage-ment and security in a single solution, it helps ensure continu-ous protection and compliance. For example, it can dramaticallyshrink gaps in security exposures by applying software patchesin minutes. And it can help bridge the gap between functionssuch as those establishing and executing strategy and policy,those managing devices in real-time, and those generatingreports on security and compliance issues. Provide accurate, precise and up-to-the minute visibility into, and continuous enforcement of security configurationsand patches. Centralize management of third-party anti-malware and firewall protection. Provide out-of-box best practices that meet U.S. FederalDesktop Configuration Control (FDCC) regulations andDefense Information Systems Agency Security TechnicalImplementation Guides (DISA STIGs). Support Security Content Automation Protocol (SCAP);Tivoli Endpoint Manager is the first product certified by the National Institute of Standards and Technology (NIST)for both assessment and remediation. Securely transmit endpoint instructions as demonstratedthrough NIAP CCEVS EAL3 and FIPS 140-2, Level 2 certifications. Support the Open Vulnerability and Assessment Language(OVAL) standard to promote open and publicly availablesecurity content. Receive and act on vulnerability and security risk alerts published by the SANS Institute. Show trending and analysis of security configuration changes through advanced security and compliance analyticsreporting. Use analytics to address the need for insight and reporting tomeet compliance regulations and IT security objectivesincluding: determining progress and historical trends towardcontinuous security configuration policy compliance, quicklyidentifying endpoint security exposures and risks, easily creat-ing and sharing summary and detailed reports about securityconfiguration policy compliance, and identifying, managingand reporting on policy exceptions and deviations. 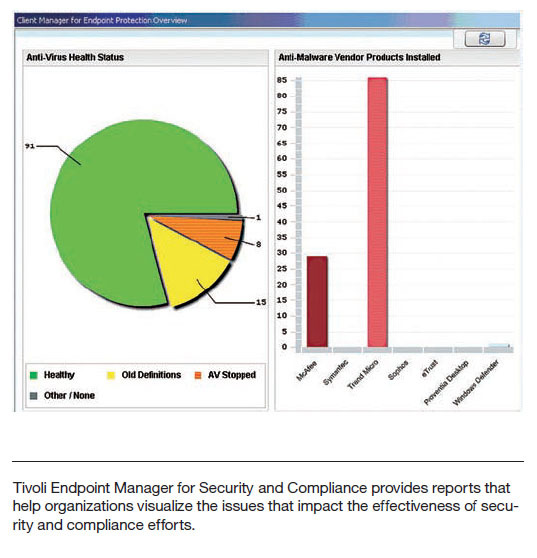 Download the IBM Tivoli Endpoint Manager for Security and Compliance Datasheet (PDF). DefenseGuard.com is a division of Virtual Graffiti Inc, an IBM Business Partner.